Your purchase of $100 entitles you to a 4" x 8" brick, engraved per your instructions, and installed in the new WIU Alumni Plaza. Your purchase of $225 entitles you to a 7" x 14" brick, engraved per your instructions, and installed in the new WIU Alumni Plaza. Buy a Brick. Build Your Legacy! The WIU Alumni Plaza Project is a unique opportunity for you to become a permanent fixture of campus and preserve your legacy as a part of our great University. 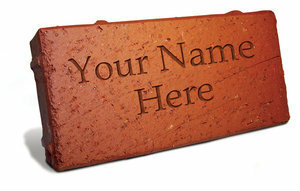 You, your family, business or student organization can purchase a personalized brick which will be installed in the new Alumni Plaza, just a few steps away from the University Union, Hanson Field, and future home of the Mascot Memorial Plaza which will pay tribute to WIU's past and present live mascots, Col. Rock. This will ensure that thousands of students, alumni and campus visitors will recognize your role as the foundation of Western Illinois University. * Upon checkout, you will receive an email with your personal link to specify your engraving instructions. A unique gift for your favorite Leatherneck - or yourself! Be a part of tomorrow - today! All bricks purchased AFTER midnight on July 1, 2018 will be placed between the time of purchase and summer, 2019. For more information about the WIU Alumni Plaza Project, contact Ashley Katz at (309) 298-1986.